Do you want electronic ignition on your 240Z? Don't want to pay through the nose? Check this out! by: Kyle Hagemann IZCC #968. Grab a brew (but just one, mind you). Take the new distributor cap, and hook the spark plug wires up to it in the right order. Unplug the black wire from the distributor, and remove the adjusting screw. 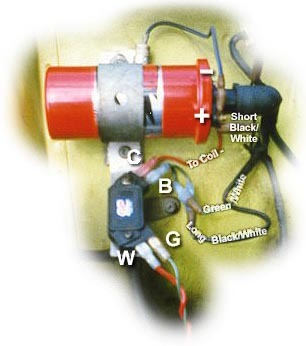 Slide the distributor out, noting the direction the rotor points. Remove the mounting bracket. This is the part that the adjusting screw screwed into. It's held in with two 10 mm head bolts. This must be replaced with the proper mount for the 280's distributor. If you screwed up and didn't get the mount from the junkyard, you may be able to modify the stock mount and/or the new distributor a bit to work. Install the new mount onto the timing case cover, sealing it with some gasket goop. Make sure that the hole for the adjusting screw is toward the front. 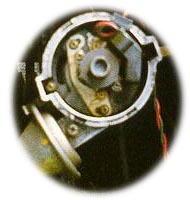 Install the distributor with the rotor pointing in the same direction as the old points distributor. Snap the cap on, and call it good. Down half your brew, and start 'er up. Make a bracket to hold the module in a position of your choosing. I used a piece of 1/16" aluminum, bolted to the lower coil mounting bolt. Drill it as necessary to hold the mod with two sheet metal screws. Here you need to make a choice - are you using an MSD coil or not? I say MSD Blaster II, but any coil designed for 12V input will work. The important distinction is between a 12V in and a coil designed to work with a resistor. If you take out the ballast resistor, but use a coil meant to have one, you will cook the coil in very short order.... It is possible to use the stock coil, and I will include stock-type coil instructions in small type. Install the new coil in the same location as stock. Hook everything up. Some of these connections will be disconnected in a few steps, but this makes it easy to keep from getting mixed up. Take out the ballast resistor. This will leave a green/white wire and a long black/white wire hanging loose. If you're keeping a stock-type coil, leave the black/white wire hooked up. There should be a black/white wire connected to the + side of the coil, and another from that terminal to the noise-suppressing capacitor above the coil. Leave them alone! There's a plain black wire connected to the - side of the coil. Disconnect it, and make a jumper to connect terminal C on the module to the - side of the coil. Attach a female connector to the + wire from the distributor (it should be a red one). Connect it to terminal W on the module. By the way, I've heard that some distributors have two green wires. To determine polarity, Andy Levy says this can be done by rotating the dist. shaft the same direction as it would be turned by the engine and use a volt meter to establish the polarity. This system generates AC current so look for a positive reading when the raised portion is approaching the pick up and negative when it departs. The final connection is from the G terminal on the module to the negative wire on the distributor. That should be a green one. Bolt your module mounting bracket to a convienient location and screw the module into it. Be sure to use the included grease. Start it up, set the timing, and road test it. Everything satisfactory? Finish your adult beverage, likely very warm and disgusting by now, and congratulate yourself on a job well done! Another thing that might help is a good understanding of how the stock system works in comparison to the HEI. If you prefer simple how-to instructions, and don't really care why, skip this part. Got your thinking cap on? In the stock setup, you have a solid black wire that runs from the coil - to the points. The points close as the dist. turns, completing the circuit. On the + side of the coil, you have a short black w/white wire. That wire is hooked up to two others under the electrical tape. One is the longer black w/white wire connected to the resistor. The other is a wire that feeds 12V+ to the coil while cranking, bypassing the resistor. The other side of the resistor is connected to a green w/white wire, which supplies 12V+ during normal operation. The reason for the cranking-position 12v+ feed is that during cranking, power is cut to other sources, like your radio. Still with me? Anyway, the HEI setup is really simple. It gets its ground by one of the mounting screws, which is switched on and off to the module's terminal C. Terminal C, in turn, is connected to the - side of the coil. This is the same as the stock setup then, because the points open and close the ground side of the primary coil circuit. The + side of the coil gets juice all the time, just like the original. It's hooked up to the balast resistor OR 12V+. If you've got a 12V input coil (MSD Blaster II), the + side of the coil is connected directly to the module's terminal B. If, on the other hand, you have a stock-type coil, the input side of the balast resistor is connected toterminal B. Got it? The other two terminals (W & G) on the module are connected to the + and - inputs from the distributor. On my dist., the + is red, the - green. If your dist. doesn't have the same colors, it's simple enough to figure out. The scoop was above, remember? Here's the theory, as I understand it: The dist., as it goes round, generates small voltages, which are sent to the module. The module then opens and closes the primary coil circuit based on these signals, in some high-tech solid state way. The key here is solid state. No moving parts, nothing to wear out, adjust, or replace. Cool huh? Did I screw something up? Forget to credit your part in this saga? Tell me!